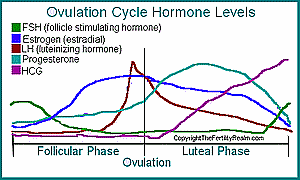 Your ovulation/menstrual cycle is divided into two main parts or phases. The follicular phase is the first part or half and is what I'll discuss here. The second part is called the luteal phase. The follicular phase begins the first day of your menstrual period or menses and ends when you ovulate. The length of this first half can be anywhere from 10 days or less to 40 or more days. The average is 14 days in a regular 28 day cycle. The length may or may not be consistent each cycle and is different from woman to woman. During this part of your fertility cycle, there are several things happening to your body and reproductive system. First, FSH, or follicle stimulating hormone, will rise. This hormone will actually start rising just before your menstruation, during the end of the luteal phase. At this same time your progesterone levels drop (assuming you haven't fallen pregnant). This signals the pituitary and hypothalamus to signal the increase in FSH production. This drop in progesterone also signals the shed your endometrium or the lining of your uterus. And you get your period. Day 1 of your menses is the first day of the follicular phase. As you can see, some things will overlap the two parts of your ovulation cycle. As you've most likely guessed by the name, FSH stimulates the ovarian follicles to grow and produce eggs or ova. Your ovum grows inside a follicle and many follicles are stimulated. These ovarian follicles grow inside (you guessed it) your ovaries. You have two ovaries, each producing many eggs. At this time, there is a 'race' to see which egg will be the strongest and the healthiest at ovulation time. This dominant follicle (and therefor, egg) will be the one to be released when you ovulate. And, of course, there are occasions that more than one egg gets to the dominant stage and then more than one will be released resulting in fraternal twins, triplets, and so forth. As your eggs or ova grow and mature, they produce estrogen, mostly estradial. This hormone is used by your body and endocrine system for several things. One is estrogen helps grow and thicken the endometrial lining of your uterus. This provides the best environment for implantation of a fertilized egg. 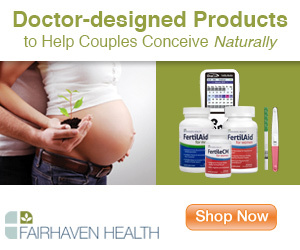 Check out the Fertility Preparation Kit here! Another is the changes you observe in your cervical mucus (CM), which is one of the most reliable signs of ovulation. Near the end of the follicular phase, as you get closer to ovulating, your CM will become thinner and less acidic to become a healthy and nourishing environment for sperm to swim up through your cervix and on to the fallopian tubes to wait for an egg to be released. Click here to find out how to promote healthy cervical mucus to increase your chances of getting pregnant. When estradial 'peaks', this signals the pituitary and hypothalamus to slow the production of FSH. This then signals the increase of LH or luteinizing hormone. LH is the hormone that tells the dominant follicle in one of your ovaries to burst and release the egg. Luteinizing hormone levels rise quickly and then fall slowly, overlapping into the second half of your fertility cycle. 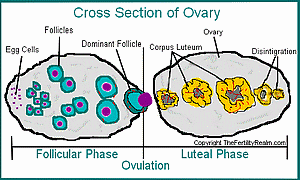 Once you have ovulated, your follicular phase ends and your luteal phase begins.